A sub-species of the Little penguin, the white-flippered penguin, is restricted to the Banks Peninsula, Motunau Island and the North Canterbury coast. Little Penguins breed across southern Australia and the islands of New Zealand, and it is estimated that their world breeding population is approximately 350-600,000 birds. The species is not endangered but some populations are threatened. Introduced mammalian predators appear to be the most significant threat with foxes, dogs and possibly ferrets and stoats (in New Zealand), being implicated in a number of colony extinctions and declines. Little (or Fairy or Blue) Penguins breed throughout southern Australia and New Zealand. In Australia, their breeding distribution extends from the Shoalwater Island Group (Penguin and Carnac Islands), near Perth in Western Australia, across the southern coast (including Bass Strait and Tasmania), and up the east coast as far as South Solitary Island in New South Wales (near Coffs Harbour) [Blakers, Davies and Reilly 1984, Marchant and Higgins 1990]. In New Zealand, Little Penguins are found around the coasts of the North, South, Stewart and Chatham Islands (Marchant and Higgins 1990, Dann 1994). The world breeding population is thought to be between 350-600,000 birds, comprising 300-500 000 in Australia (Ross et al.1995) and c.50-100 000 in New Zealand (estimated from Robertson and Bell 1984). These figures are undoubtedly underestimates as new colonies are still being found. Bass Strait, with c. 60% of the known breeding population, is the stronghold for the species in Australia. While the species is not endangered, some populations are threatened and penguins no longer breed at some previously occupied sites. In addition, the size of some breeding colonies has been diminished since European settlement in both Australia and New Zealand (Dann 1992, 1994). Conversely, several new colonies have become established in the recent past, for example at St. Kilda in Victoria, where approximately 200 birds now breed on a breakwater constructed for the 1956 Olympic Games (M.Cullen, unpublished obs.). Most Little Penguins do not breed until they are two or three years old and, until they are mature, are not included in estimates of breeding populations. However, it has been calculated by Dann and Cullen (1990) that these pre-breeding individuals constitute 57% of the population on Phillip Island and if these young birds are included, the total world population is more than double the estimated breeding population. Little Penguins usually breed on offshore islands or, less commonly, along parts of the mainland coast that are inaccessible to mammalian predators. Most breeding sites are adjacent to the sea, with burrows in sand or soil or under vegetation, but in some areas the birds nest in caves or crevices in rock falls. A few sites are in urban areas and some are on anthropogenic structures such as breakwaters. The type and structure of vegetation in the breeding areas varies from sparsely-vegetated caves and rock screes through grass-, herb- and scrublands, to woodland and forest (Marchant and Higgins 1990, Dann 1994, Fortescue 1995). Introduced mammalian predators appear to be the most significant threat to penguins on land with foxes, dogs and possibly ferrets and stoats (in New Zealand), being implicated in a number of colony extinctions and declines. The role of cats in determining the distribution and abundance of penguins varies, being apparently unimportant on Phillip Island (Dann 1992) but possibly significant on Wedge Island in Tasmania (Stahel and Gales 1987). There is no published evidence to suggest that introduced rats kill adult or young penguins or reduce hatching success. Penguins are killed by cars at a number of places where they cross coastal roads at night to reach their burrows; notably Phillip Island and Portland in Victoria, Bruny Island and Lillico Beach in Tasmania, and Oamaru and Wellington in New Zealand. The effects on the population sizes at each site vary and in some cases road mortality has clearly contributed to declines in breeding numbers. Deliberately lit fires are believed to have caused declines in numbers of penguins breeding on De Witt Island in south-west Tasmania between 1975 and 1977 (White 1980). Fortunately the practice of burning of Bass Strait Islands seems to becoming less common, but it is likely to have contributed to declines in numbers at many sites in the past. Penguins being taken for crayfish bait are thought to have reduced �alarmingly� the population of De Witt Island during the 1950s and 60s (White 1980). Although this practice may have once been widespread, it now appears rare.Diseases are of limited importance in penguin populations in Victoria (Harrigan 1988, 1992) and there is no indication that they may be significant elsewhere or that anthropogenic sources are contributing to their incidence. For birds frequenting most areas, relatively little is known of their foraging areas at sea, either during the breeding season, when they return daily, or every few days to the breeding colony, but may still range more than 100 km from their burrows. Outside the breeding season they can travel farther but existing evidence from radio-tracking suggests they remain within 20 km of the coast (Weavers 1992, Collins, Cullen and Dann 1994). Little Penguins are the most likely seabirds in southern Australia to come into contact with oil spills at sea (Dann 1994b). For example, of 828 birds oiled in nine pollution incidents of small or intermediate size in southern Australia, 448 (54%) were Little Penguins (Dann in prep.). While small numbers have, apparently, been involved to date, the potential exists for oil spills to have major, even catastrophic, effects on penguin populations. Forty percent of the birds breeding at a small colony (c. 100 birds) at Portland in western Victoria were killed in an oil spill in 1988. Colonies near oil terminals and ports are clearly most at risk as this is where most oil spills occur (Dann in prep.). Organochlorine and heavy metal accumulations at levels typical for temperate latitude seabirds have been found in Little Penguins from near Sydney and at Phillip Island (Gibbs 1995), but it is not known whether these levels interfere with the penguin�s health or breeding success. Plastic pollution is another hazard for penguins at sea and causes problems for penguins in two ways; through entanglement and ingestion. The commonest types of entanglement are caused by plastic yokes from cans and bottles (six-packs) and fishing line. The yokes or lines usually entangle the flippers, feet or bill of the penguin and result in either the loss of condition or starvation because feeding is impaired, or the bird becomes exhausted and drowns (Dann 1990). The incidence of penguins being caught in six-pack holders at Phillip Island has been reduced to insignificant levels since the introduction of more degradable plastic yokes in the early 1990s. Plastic may also be swallowed by penguins while foraging, either being mistaken for food or taken incidentally when catching fish. Ingestion of synthetic material increased eleven fold at Phillip Island between 1979 and 1989 (Cullen and Montague, unpublished obs.). However it seems unlikely that the amount ingested would have produced a detectable reduction in body condition and the number of penguins that had swallowed plastic was also relatively small (1.3%) [Cullen and Montague, unpublished obs.]. Clupeoids (Pilchards Sardinops neopilchardus, Australian Anchovy Engraulis australis and Sandy Sprat Hyperlophus vittatus) are the major foods of Little Penguins (Cullen, Montague and Hull. 1992) and both pilchards and anchovies are taken commercially in Australia and New Zealand. Over-fishing has been implicated in the collapse of some populations of the African Penguin Spheniscus demersus (Burger and Cooper 1984) but because of the complexity of the interaction, it is seldom possible to prove that competition occurs between commercial fisheries and penguins. Fishing nets suspended in the water column have been the source of some mortality for penguins throughout New Zealand (A. Tennyson, pers. comm. ), at Victor Harbour and Nepean Bay in South Australia (Copley, in press) and in Corner Inlet and Corio Bay in Victoria. How commonly this type of mortality occurs is not known because reporting rates are likely to be low but, unlike parts of New Zealand, this netting practice is not widespread in Australia. It is clear that indirect threats, such as habitat loss through weed invasion, erosion, grazing and housing developments (Harris and Bode 1981, Fortescue 1995), have had an impact on the distribution and abundance of penguins in some areas. Habitat loss is particularly a problem at mainland sites or on islands that are intensely settled. Trampling of burrows by humans and stock is a contributor to habitat loss, particularly where erosion develops as a consequence. Fire and rabbits can be a danger by destroying the above ground vegetation among which the nests are situated or which provides the soil support to stop burrows collapsing. Some introduced weeds cause severe loss of breeding area, eg. Kikuyu Grass Pennisetum clandestinum which forms dense patches which penguins find difficult to penetrate. On Bowen and Montagu Islands, kikuyu is recognised as a serious pest and measures are in replace to eliminate it (Fortescue 1995, Klomp, pers. comm.). Cape Ivy Senecio mikanioides also reduces available space for burrowing seabirds. Of the many potential threats outlined above, several have been identified as actually having a significant impact on penguins, albeit often in quite localised areas. However over a long period of time, these small impacts can amount to quite large reductions in local populations. Predation by introduced predators, fire, human poaching and oil spills appear to have played roles in population declines in the past. The fact that most seabird colonies, including those used by penguins, are situated on islands is no doubt because they are safer there from terrestrial predators. This must have been true before European settlement with respect to native predators; it would have been even more true after the introduction of foxes and dogs, which are still a serious threat in some penguin colonies, aggravated by their habit of multiple killing. Forty or fifty birds can be slaughtered in a single night. The threat of foxes for native wildlife is well-recognised, as is the problem of controlling it. Foxes do not occur in Tasmania (including the islands in Bass Strait), on Kangaroo Island in South Australia, in New Zealand or on most offshore islands within the Little Penguin�s range. Fox control programs are in place in some areas where penguins occur and eradication is being attempted on Phillip Island. Dog predation is often quite localised and short-term solutions with community involvement have been effective in some places in the past. Colonies on the Tasmanian mainland seem particularly vulnerable to dog predation because many are near human habitation. Another potential threat to populations, that has yet to be confirmed but seems likely, is the reduction of food supplies, either through declining water quality caused by pollution, competition with commercial fisheries or through other factors reducing fish stocks. There are many kinds of human disturbance, but a major challenge for the management of penguin colonies is the commercial pressure to allow public viewing. There are 13 sites in Australia where viewing of Little Penguins in the wild is an organised activity for commercial or community purposes. These are: NSW (including Jervis Bay Territory) Montague and Bowen Islands; VIC Phillip Island, St Kilda; TAS Penguin, Lillico Beach, Bicheno, Low Head, King and Bruny Islands; SA Granite Island and Penneshaw and Kingscote on Kangaroo Island. People have been watching Little Penguins come ashore at Summerland Beach on Phillip Island since 1928. This nightly event is known as the �Penguin Parade� and it currently attracts almost 500,000 tourists each year. Although most of the visitors come from within Australia, it is also the most important component of international tourism in the region. Approximately 10% of the penguin population on Phillip Island is exposed to tourism. Mean numbers of penguins coming ashore at the Parade declined significantly from 1978 until 1988 and potential causes, including tourism, were examined. Breeding productivity, survival of adults, philopatry and the movements of adults were found to be not significantly different for birds breeding inside or outside the tourism area (Dann 1992 and in prep.) indicating that the nightly penguin viewing was not contributing to the decline. Penguin viewing has obvious cultural and financial benefits to local and regional communities, and the generation of revenue by the penguins, and public interest in the penguins, are persuasive factors in ensuring their proper management. In addition to those threats already apparent, there are some that may come about in the foreseeable future. The long-term effects of global warming may cause significant shifts in distribution through increases in both sea-level (causing the inundation of breeding habitat) and sea temperature (reducing the viability of breeding colonies in the northern parts of the range). The establishment of feral populations of ferrets Mustela putorius in Australia (as has occurred in New Zealand) would seem to present a serious threat were they to come into contact with penguins in Australia as they have in New Zealand. Ferrets are kept as pets in Australia and have been reported in the wild in some areas, although it is not known if these individuals are a part of self-sustaining populations. Most penguins breed on offshore islands. There is rarely any evidence (with some exceptions referred to below) of any extinctions or population fluctuations of these colonies. This is probably due to the difficulties of access to many of these colonies and the large errors associated with estimating breeding numbers have resulted in scant data with which to assess any trends. While there seems to be no evidence of decreasing numbers in colonies on offshore islands, with some exceptions, the same cannot be said for some colonies on the mainlands of Australia, Tasmania and New Zealand. In the Otago region of New Zealand, Little Penguins no longer breed at seven previously occupied breeding sites (Dann 1994). In Australia, there have been reductions in numbers of breeding birds at Eden, New South Wales (Barton 1978); Portland, Victoria (Department of Conservation and Natural Resources, Victoria, unpublished data); Penguin, Tasmania (N. Showell, pers. comm.) and, in New Zealand, at Green Island and Allen�s Beach, Otago (Dann 1994). Alternatively, numbers of breeding birds are thought to have increased at St. Kilda, Victoria (M. Cullen, pers. comm. ), at Phillip Island, Victoria since late 1980s, and in New Zealand at Oamaru and Taiaroa Head (Dann 1994). In summary, Little Penguins appear to be relatively secure throughout much of their range, although many colonies on the Australian mainland, in Tasmania, and on the North and South Islands of New Zealand have apparently declined. Fortunately, most populations on offshore islands are not immediately threatened, and these islands will be the main breeding areas of the species in the future. Introduced mammalian predators are their most significant threat, with anthropogenic factors reducing food supplies, and major oil spills being potentially significant in the future. Barton, D. 1978. Breeding Fairy Penguins at Twofold Bay, NSW. Corella 2: 71-72. Blakers, M., Davies, S. J. J. F. and Reilly, P. 1984. The Atlas of Australian Birds. RAOU and Melbourne University Press, Melbourne. Bowker, G. 1980. Griffiths Island. Seabird Islands No. 99. Corella 4: 104-6. Burger, A. E. and Cooper, J. 1984. The effects of fisheries on seabirds in South Africa and Namibia. Pp. 150-60 in Marine Birds: Their Feeding Ecology and Commercial Fisheries Relationships. Eds. D. N. Nettleship, D. A. Sanger and D. F. Springer. Canadian Wildlife Service, Ottawa. Collins, M., Cullen, M. and Dann, P. 1994. Radio-tracking Little Penguins at sea. Report to Esso, BHP Petroleum and the Penguin Reserve Committee of Management. Cullen, J. M., Montague, T. L. and Hull, C. 1992. Food of Little Penguins Eudyptula minor in Victoria: Comparison of three localities between 1985 and 1988. Emu 91; 318-341. Copley, P. in press. A review of the status of seabirds in South Australia. Proceedings of Seabird Workshop., November 1992. Australian Nature Conservation Agency, Canberra. Dann, P. 1992. Distribution, population trends and factors influencing the population size of Little Penguins Eudyptula minor on Phillip Island, Victoria. Emu 91: 263-272. Dann, P. 1994. 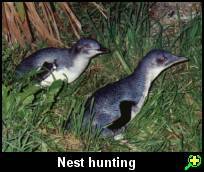 The abundance, breeding distribution and nest sites of Blue Penguins in Otago, New Zealand. Notornis 41; 157-166. Dann, P. 1994b. The vulnerability of Australian seabirds to oil spills. Proceedings of the RAOU Seabird Congress, Hobart, 1993. Australasian Seabird Group 27: 16. Dann, P. and Cullen, J. M. 1990. Survival, patterns of reproduction and lifetime reproductive output of Little Penguins Eudyptula minor on Phillip Island, Victoria, Australia. Pp. 63-84 in Davis, L. S. and Darby, J. (eds.). Penguin Biology. Academic Press, San Diego. Fortescue, M. E. 1995. Biology of the Little penguin Eudyptula minor on Bowen Island and at other Australian colonies. Pp. 364-92 in Dann, P., Norman, I. and Reilly, P. (eds.). The Penguins: ecology and management. Surrey Beatty & Sons, Sydney. Gibbs, P. J. 1995. Heavy metal and organochlorine in tissues of the Little Penguin Eudyptula minor. Pp. 364-92 in Dann, P., Norman, I. and Reilly, P. (eds.). The Penguins: ecology and management. Surrey Beatty & Sons, Sydney. Harrigan, K. E. 1988. Causes of mortality of Little Penguins. Pp. 705-16 in Australian Wildlife, Proceedings 104, Post-Graduate Committee on Veterinary Science, University of Sydney. Harrigan, K. E. 1992. Causes of mortality of Little Penguins Eudyptula minor in Victoria. Emu 91: 273-77. Harris, M. P. and Bode, K. G. 1981. Populations of Short-tailed Shearwaters and Little Penguins, and other seabirds on Phillip Island, 1978. Emu 81: 20-28. Hodgson, A. 1975. Some aspects of the ecology of the Fairy Penguin Eudyptula minor novaehollandiae (Forster) in southern Tasmania. Ph. D. thesis, University of Tasmania. Kinsky F. C. and Falla R. A. 1976. 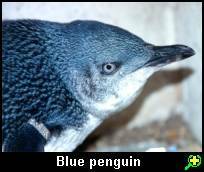 A subspecific revision of the Australasian Blue penguin (Eudyptula minor ) in the new Zealand Area. Records of the National Museum of New Zealand 1: 105-26. Marchant, S. and Higgins, P. J. (eds.). 1990. Handbook of Australian, New Zealand and Antarctic Birds. Volume 1. Part A. Oxford University Press, Melbourne. Reilly, P. N. and Cullen, J. M. 1981. The Little Penguin Eudyptula minor in Victoria. II: Breeding. Emu 81: 1-19. Reilly, P. N. and Cullen, J. M. 1982. The Little Penguin Eudyptula minor in Victoria. III. Dispersal of chicks and survival after banding. Emu 82: 137-142. Robertson C. J. R. and Bell, B. D. 1984. Seabird Status and Conservation in the New Zealand Region. Pp. 573-86 in Status and Conservation of the World�s Seabirds. Croxall, J. P., Evans, P. G. H. Evans and Schreiber, R. W. (eds.). ICBP Technical Publication No. 2. Ross, G. J. B., Burbidge, A. A., Brothers, N., Canty, P. Dann, P., Fuller, P. J., Kerry, K. R., Norman, F. I., Menkhorst, P. W., Pemberton, D., Shaughnessy, G., Shaughnessy, P. D., Smith, G. C., Stokes, T. and Tranter, J. 1995. The Status of Australia�s Seabirds. Pp. 167-82 in The State of the Marine Environment Report for Australia. Technical Annex 1. The Marine Environment. Zann, L. P. and Kailola, P. (eds.). Great Barrier Reef Marine Park Authority, Townsville and Department of the Environment, Sport and Territories, Canberra. Stahel C. and Gales, R. 1987. Little Penguins: Fairy Penguins in Australia. New South Wales University Press, Kensington. White, C. 1980. Islands of South-west Tasmania. Published by the author, Sydney. Weavers, B. W. 1992. Seasonal foraging ranges and travels at sea of Little Penguins Eudyptula minor, determined by radiotracking. Emu 91:302-17.